Only if you want to have some text on your slider the setting box for text appears. This will happen if you enter some text to the boxes at the bottom where your images are displayed. This is where the red arrow points to in picture. You may enter some text for each picture you have uploaded. By the way, you may also enter emoticons in the text field. Than press the green update button and your text entry will appear in the slider. Furthermore the box for text settings will appear. In the picture you see a red and a blue box, this is where you can style your text, respective the background as well as it's position. Red box: The first 4 values are for the text. Font size: Depending on the size of your slideshow and also the length of your text, choose the best fitting value for your needs here. Font color: This is the color picker for the color of your text. Font align: Choose the way your text should get aligned. Font face: Which font do you want to use? Make your selection here. Blue box: The other values in the blue box are the values for the text field. Textfield color, this is the color picker for the background color. In the example in the picture white was chosen. Textfield chroma, here you will select a value for transparency. “0” is completely transparent and “1” is no transparency at all. Textfield position: Do you want your textfield at the bottom or at the top in your slider? Select that here. Textfield offset: Don't you want your text field directly at the bottom or at the top? Than give a offset value here. That's the distance (px) from the bottom or the top, depending on what you have chosen in the box before. Textfield padding: This value has an effect on the distance between your text and the outer limit of the text box. A higher value creates a larger text field, a smaller one creats a smaller text box. In the example “12” was chosen. So let's have fun and play on that to find the best settings for your slider. And don't forget to press the update button after you made any changes. 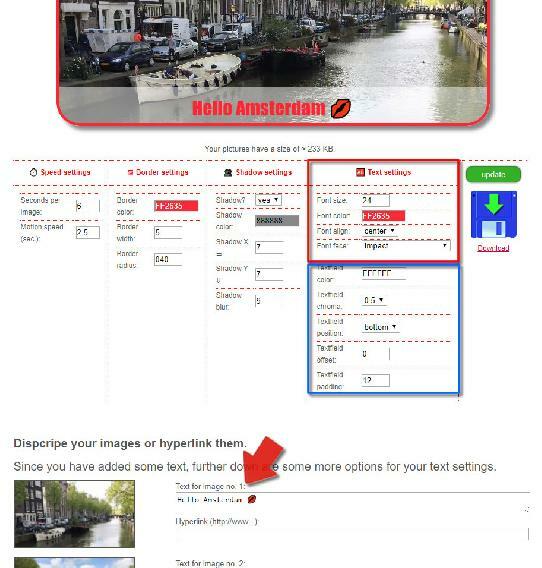 What I like very much is that the picture files get named according the text one enters to descripe a picture in the slideshow. That's a cool idea what brings me additional visitors via Google Picture Search! Thanks for that guys and keep up the good work.